At the end of the 2016/2017 season, the second phase of the White Hart Lane demolition commenced as Tottenham moved to Wembley as the redevelopment took place. There were 13 weeks scheduled to complete the demolition. The stands at WHL have been developed over a number of years, there have also been adaptions and modifications. The East stand was the oldest having been reconstructed in 1988. The roof of the stand was supported on a truss extending from the south to the north stand. The truss when constructed was supported on 4 columns. However, when the south and north stands were constructed the end columns were removed and the truss supported from the new stand trusses. On the south stand this was direct hanger from the new truss, on the north stand, however, a gallows truss was provided extending from the new north truss, and anchored back to tension ties at the back of the stand. The north stand had a main truss at the front of the stand supported at the ends on braced steel towers. The tower at the east end would be exposed at the completion of the Phase 1 works. The south stand was similar to the north stand, however at the east end the supporting tower formed part of the access core and was significantly offset for the truss line. A gallows truss extending from this core supported the truss on a skew bearing shelf. Gallows truss supporting South stand primary truss, hanger to support East stand primary truss. The west stand was the last constructed and was an RC structure with a cantilevered roof. This stand incorporated the administration block. The phase 2 works of the White Hart Lane demolition commenced in May 2016 and encompassed the total demolition of the remainder of the stadium. DSM commissioned a new ULR demolition machine for these works. This machine fully rigged carries a 70m boom, however for the works at WHL the machine was rigged with a 40m boom and carried a 6.5Te universal attachment. 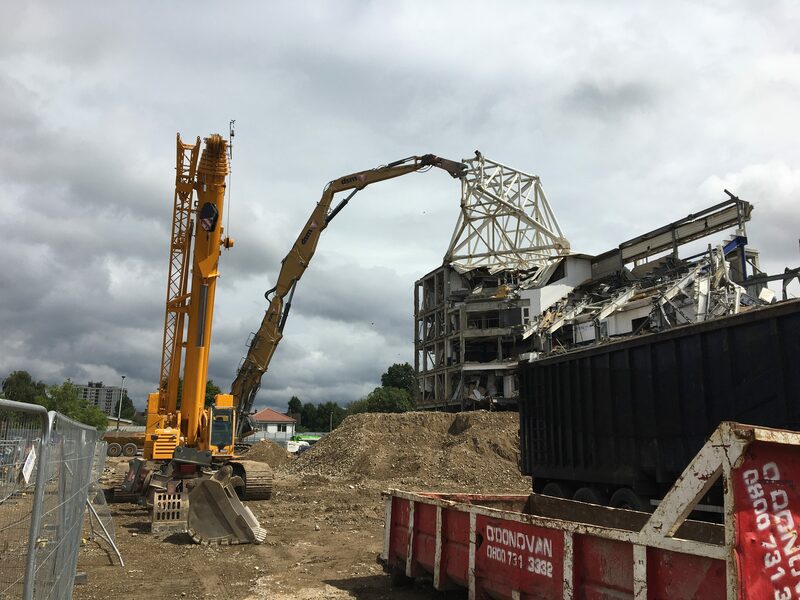 This machine was attended with a number of other demolition specification machines in the 50 to 75Te range and together they made short work of the majority of the stadium. Two elements of the work required further input from Andun. A lifting sequence was developed by F&N for the dismantling of the north truss. This required a tandem lift for the main section of truss. In order to support the truss and accommodate the lifting equipment a pair of lifting beams were designed. The lift down was undertaken successfully but took longer than planned. A change was made for removing the final section which comprised the west tower and a cantilevered section of truss. This was pulled down mechanically. The south stand primary truss was the final truss to be removed. The truss was approximately 110m long, 8m high and 3.5m wide estimated weight was approximately 250Te. The truss was set 26m above pitch level. The truss was initially to be subject to a blowdown using shaped cutting charges to sever the supporting chords; however concerns regarding blast over pressure resulted in this proposal being dropped. The second proposal was a tandem lift using two large crawler cranes similar to the north truss. When examined closely the works required became prohibitive. The crane to be used were currently being used for construction of the new stand, to reconfigure them for the truss lift required significant work. Boom changes, addition of super-lift and other works would have denied the cranes to the construction works for at least a week, which would have significant programme implications. In addition F&N had concerns regarding the lift and required a cradle to be designed and fabricated for the lift. This again was a significant amount of additional work and would delay the demolition works which were on a very tight schedule. Up to this stage Andun had had no involvement, however following a phone call from site we attended to see if any alternative solution could be developed. DSM initially proposed a cut and drop, however a review on site confirmed this was unfeasible due to truss geometry and the inability to time the works to give a clean drop. A review on site confirmed the feasibility of doing a pull down, however there were a number of issues which required considerable thought. The east end of the truss was supported on bearings on skew bracket supported on the gallows truss. The west end sat on simple pot bearings supported on the east legs of the support tower. These were a particular problem as it was feasible during the pull down for the truss to sit into the tower and get trapped with the potential to overturn the support tower and cause significant unintentional damage. A further complication was the strain energy in the gallows truss, when the weight of the truss was removed unintentional damage may result from the release of this energy. After considerable thought a solution was developed, this required pulling at various angles and timings. The plan was to release the east end from the gallows truss and immediately it was free to give a quick tug on the west end to ensure a clear drop from the west tower. A weight was attached to the gallows bracket on a steel wire. This weight was then buried in a pile of fill. This system acted as a dashpot piston to slow the release of the strain energy from the gallows truss. A 3d model was drawn up and a series of drawings prepared to illustrate the scheme. Fortunately there was no shortage of pulling power on site to execute the pull down. Andun attended site on the appointed day to supervise the preparation works and the pull down. Whilst there were slight delays in getting all the preparation works completed successfully, the pull down in front of a crowd of approximately 2000 people was undertaken flawlessly. The successful pull down ensured that the demolition works were completed on time and apart from the day of the pull down (everyone watching) there was minimum interruption to the construction works.